Users can now include Thermobreak Thermal insulation on the enclosure. This insulation is an all-in-one closed cell physically cross-linked polyolefin foam that is manufactured in compliance to ASTM C1427 Standard. 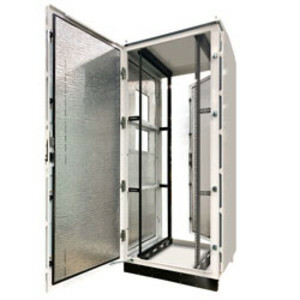 Introduced to all internal surfaces of the enclosure, Thermobreak is designed to provide a high level of protection from heat penetration into the enclosure. 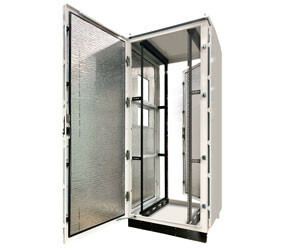 To further enhance heat protection, users have the option to also add external vandal-resistant sun shields to the doors, sides and the top of an enclosure. These shields reduce the amount of direct sunlight on an enclosure while allowing air to move between the enclosure skin and shield. Available in various sizes from 12RU to 45RU, in either free standing or wall mounted. There are also mild steel, stainless steel and aluminium variants. The S280 range is designed to be strong and robust in any situation. All cabinets are continuously welded and finished to the highest standard. I am interested in MFB 19″ rack mount enclosures .